“You don’t find all this history and theory stuff painfully boring?” I asked. The year was 2012, and I had just finished a lecture on Chinese Medicine theory in my brick-and-mortar studio. In order to make sense of the theory, I also had to teach some history. “Not even a little bit,” she said. This surprised me. For years, I had assumed that students weren’t interested in esoteric Eastern theories, and that they DEFINITELY weren’t interested in history. I mean, I LOVE both the history and theory aspect of qigong, but I’m an outlier. Or am I? In a previous article about the acupuncture meridians, I asked my readers if they wanted to learn more. The answer was loud and clear: YES!! Apparently, I’m not an outlier. Thousands of you enjoy learning about history and theory, just like I do. So my fellow nerds…shall we get this party started? In my previous article, I used the term Acupuncture Meridians, but not because it’s correct. I used it so people would have some clue what I’m talking about! If I used the term “Qigong Meridians”, many people would be confused, especially people who are more familiar with acupuncture. Actually, both terms — Qigong Meridians and Acupuncture Meridians — are equally INCORRECT. As I’ve said, the Chinese term is jingluo (經 絡, pronounced jing-low), which translates to “channel”. In other words, we could just as easily use the term Qigong Meridians, Acupressure Meridians, or Tai Chi Meridians. All of these terms are equally inaccurate. It gets worse! The term acupuncture meridian is actually a DOUBLE misnomer! Not only is the term “meridian” a poor translation of jingluo, but the term “acupuncture” is just utter Western nonsense! Zhen (針) means needle, and jiu (灸) means moxibustion (see above). So zhenjiu literally translates to “needling and moxibustion”. I know what you’re thinking: Where the hell did the word “acupuncture” come from? It’s a good question. The term “acu” comes from the latin for “needle”. So they got that part right. But “puncture”? Where did that come from, and who thought that this was a good idea? Talk about bad PR! I can’t think of a worse word to scare off confused Westerners. Unfortunately, the word stuck (pun definitely intended). Not only that, but the term “acupuncture”has become an umbrella that refers to several branches of Chinese Medicine, not just acupuncture. For example, most acupuncturists today also practice Chinese herbal medicine. Traditionally, these were two separate arts. But today, they often all under the same moniker of “acupuncture”. Here’s a simple way to make sense of all this: It’s all Chinese Medicine! Qigong, acupuncture, acupressure, herbal medicine, tuina — these are all branches of Chinese Medicine. By Chinese Medicine, I’m referring to the 5000-year old system that originated in what we now call China. The traditional term is zhongyi (中醫, pronounced jawng yee) which translates nicely to “Chinese Medicine”. This ancient medicine not only influenced all of the Chinese arts that I listed above, but also influence arts in much of Asia. In other words, Chinese Medicine is everywhere! Today, it’s not just in Asia, but all over the world. Enough history. Now that it’s clear that we’re really talking about Chinese Medicine rather than just qigong or acupuncture, let’s dive into some theory. The meridians are divided into 2 main categories: the jingmai (經脈, pronounced jing-my) and the luomai (絡脈, pronounced low-my). In qigong, we’re mainly concerned with the 12 Primary Meridians and the 8 Extraordinary Meridians, which is why I put them in boldface. You’ll notice that each meridian is associated with an internal organ. The meridian is NOT the organ. It’s tempting to the Western mind to hear “Heart Meridian” and just think of the physical organ that we know of as the heart. That’s a mistake, and if you think that way, you’ll never understand Chinese medicine. In Chinese Medicine, the organ-meridian association is called Zang-Fu (臟腑, pronounced zahng foo). In Zang-Fu theory, the organs fall into 2 main categories: yin and yang. If you think of the Zang-Fu simply as organs, like we do in the West, then you’ll get confused. It’s better to think of each organ as a SYSTEM. In Western Medicine, we have systems like the Circulatory System, the Endocrine System, the Nervous System, etc. The Circulatory System involves more than just the physical heart, and the same is true of the Heart Meridian. Yin Meridians run down the more yin part of your arm. For example, the palm and the inner forearm are less than than the back of the hand and the back of the forearm. The same is true of the legs. The inner thighs are paler than the outer thighs. 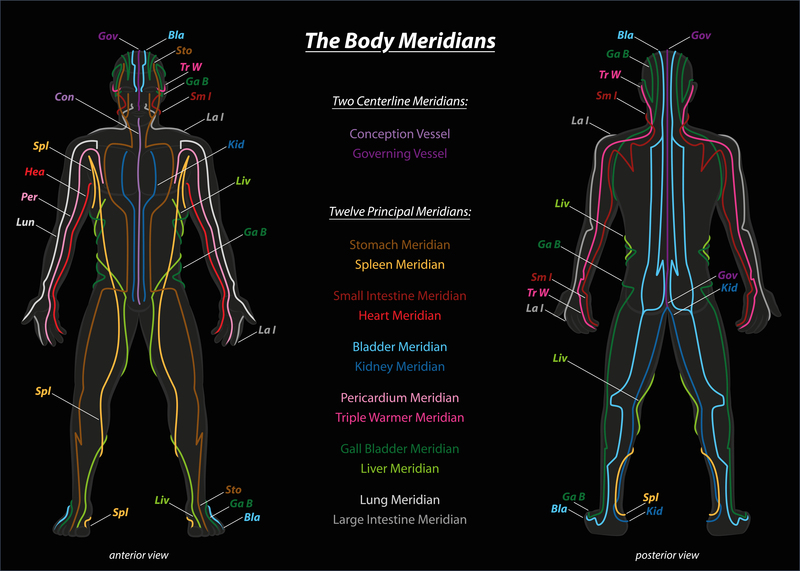 This will simplify things when trying to understand where the meridians are located (see below). Where are the 12 Primary Meridians? Luckily, this isn’t necessary for most people, and it’s definitely not necessary for qigong students. The Lung Meridian runs from your chest, down the inside (yin and pale) part of the arm, and ends at the tip of your thumb. The Heart Meridian starts in your chest and runs down the inside (yin and pale) part of the arm to your pinky finger. The Pericardium Meridian runs from your chest, down the inside (yin and pale) part of the arm, and ends at the tip of your middle finger. The Sanjiao Meridian starts at the tip of your ring finger and runs up the outside (yang and tan) part of the arm, around the shoulder, and ends above the ear. The Small Intestine Meridian starts at the the tip of your pinky, runs up the outside (yang and tan) part of the arm, and ends near the entrance to the ear canal. The Large Intestine Meridian starts in the tip of the index finger, runs up the outside (yang and tan) part of the arm, and ends next to your nostril. The Spleen Meridian starts at your big toe, runs up inside (yin and pale) part of your leg, up the torso, and ends near the front of your shoulder. The Kidney Meridian starts at the bottom of the foot, runs up inside (yin and pale) part of your leg, up the belly, and ends near the clavicle. The Liver Meridian starts at the tip of your 2nd toe, runs up inside (yin and pale) part of your leg, and ends on the front of the torso. The Gallbladder Meridian runs from the outer corner of your eye, down the side of your head, down your body, down the outside (yang and tan) part of your leg, and ends in the 4th toe. The Bladder Meridian starts at the inner corner of your eye, runs up the head, all the way down the back, down the outside (yang and tan) part of the leg, and ends in the pinky toe. The Stomach Meridian runs from just below your eye, down your torso, down the outer front (yang and tan) part of your leg, and ends in the 2nd toe. And here’s a helpful image if you want to geek out on the meridians. Click the image to enlarge it. Whew! And that’s just an overview. Now, do you see why acupuncture college requires 4 years and thousands of hours of training? The Ren Mai and Du Mai are the two that we’re most interested in. The Ren Main runs from your chin down to your perineum, and the Du Mai runs from your perineum, up your spine, over the top of your head, to your upper lip. When you connect these two meridians and direct lots of qi into them, you get what is sometimes known as the Small Universe, also called the Small Heavenly Circuit or Microcosmic Orbit. I like the idea of a circuit because that’s what it is. It’s a powerful energetic connection. This connection is HUGELY important for martial artists. In fact, I would go so far as to say that the reason most people in the 21st century have little internal power (neijin, read more here) compared to past masters is simply because they don’t have the Small Universe. Let me be clear that many people PRACTICE the Small Universe, often for years or even decades, but they don’t HAVE it. And the main reason they don’t have it is because they haven’t spent enough time with more fundamental techniques. 7 Secrets of the Small Universe Qigong. We can’t talk about meridian theory without also talking about the “points”. Some people believe that there are over 2000 different points. Modern students of acupuncture typically learn 300-400 points. In 1992, The World Health Organization (WHO) developed A Proposed Standard International Acupuncture Nomenclature Report, which identifies 361 acupuncture points. But what are acupuncture points? As I’m sure you will have guessed by now, the term “acupuncture points” is no bueno. Not only are they used outside of acupuncture, but they aren’t even points! For example, my qigong students often feel a tennis-ball-sized vortex of energy at laogong (勞宮), which is located in the center of the palm. In other words, they feel not a tiny point of energy, but a vortex. And this happens in qigong, not acupuncture. Actually, vortex is a good word because it gives us a better idea of what acupuncture points really are. Those words give us the idea of a cavity or depression where “movement” takes place. What kind of movement takes place in these depressions?? The movement of qi, of course! Whew! We covered a ton of ground in just one post! Anyone ready for recess? Remember, you do NOT need to memorize this information in order to have a healthy, thriving qigong practice. The Meridian is a system, not just an organ. I hope this post helped you to better understand the meridians and how they relate to your qigong practice, even if it’s just food for thought. Many of my students enjoy having a better working knowledge of Chinese Medicine theory, and our Facebook group has become a great place to discuss these topics. Why not join us over there! It’s free! And as always, if you think that this post will help someone, then please click the share buttons below. To understand meridians from a western perspective, Anatomy Trains (Myers) is the way to go. He shows latest fascia tissue research and shows, that fascia tension lines are almost perfectly congruent to meridian lines. Also acupuncture needles were shown to stimulate fascia tissue, giving a clear healing mechanism and an explanation how the stimulation affects distant tissue/organs. Some bits are not explained by fascia tissue, here the lymphatic system comes into play. accupressure points typically relate to either fascia lines or lymph nodes. There is still some more in TCM that is not explained by those systems, but the vast majority of interactions can be explained by fascia and lymphs. Hi Sifu. I keep forgetting to thank you for the article on the Small Universe. I had recently had a breakthrough using the Turning Head technique. I felt great, but after a few weeks I had, I suppose, gotten used to this better feeling. After reading about the Small Universe and how you shouldn’t, ahem, EFF with it unless you really are ready and know what you’re doing, I started to feel like maybe I have more awesome breakthroughs ahead! You’re the best, I’m grateful for you and for qigong every day! When I was a kid I went university and studied physiology, biochemistry, physiological psychology and biophysics, in a attempt to understand the body-mind-heart complex with the hope of implementing an overall system tune-up. After some 5 years of delving into these areas of research one of my more honest professors simply said to me: “We don’t really know anything……we just sort of make this stuff up.” That’s when I quit. I wasn’t looking for a job. I wanted understanding……how to become a healthy, happy human being. In other words, yes, I am vitally interested in the history and theoretical presentation of the science behind ancient Chinese medicine, otherwise known as qigong, for the purpose of practical application based on a conceptual framework. Perhaps you’ll be covering some of this material in your book. I sincerely hope so. My thought is that, if you do, you can include the sale of your book along with course registration, and assign specific reading as the classes unfold, perhaps in conjunction with related class teachings to bring the book knowledge into focus. Looking at those diagram charts for the first time is somewhat overwhelming; but the point is that this stuff really works, as opposed to so much speculative analytical theory and dangerous drugs pushed by big pharma. In other words, becoming conversant with these concepts in a good investment of our energy. Maybe you can be the jinglow for the flow of information. I always thought of the acupuncture points as locations on the meridian/channel that are best suited for receiving an injection or boost of energy into the channel that “services” or energizes specific organs. Sort of analogous to the battery post in the car. The battery services the car as a whole in various ways; but the post is the point at which a “jump start” can be applied. In the same way, I have always thought that a real acupuncturist not only stimulated specific points physically, but did so by contributing a jump start of their own energy when inserting the needle. In other words, I have been thinking that to be a real acupuncturist, means more than theoretical understanding, but to be a master of one’s own energy/qi and to be skilled in the ability to channel that qi to another being, weather through martial arts or through healing techniques. Am I getting close? The specific question that arises when reading this kind of material is: “How can I begin to bridge the gap between this knowledge and my present practice of qigong so that I can enhance and expedite my “skill” of directing chi flow within my hardware/software complex. In other words, how can we bring our theoretical understanding to the point of practical application? Or are we too much in the neophyte category to be considering these issues? amazing post Anthony, full of great info but easily understood and especially the diagrams. thankyou so much for sharing. vitally interested in hearing more. Dear Sifu, thanks for a very informative article and one that includes the right way to pronounce Chinese words. I find this really helpful and few qigong teachers do this. I’m glad you found it helpful Terry! Does the qi flow through all these meridians in one giant, connected, sequential circuit? If so, what is that full path, from one meridian to the next? Any particular qigong or any qigong? Sorry, I’m not sure I understand your question. This article and the comments are great, thanks everyone. I am going to step out here on a limb and say that my TCM [Traditional Chinese Medicine] teacher — we study herbs, tuina, nutrition, & ++ , but only reference to qigong, tai chi, etc — says that tuina was likely developed before acupuncture. This seems reasonable to me because humans had fingers & hands before they created needles. I’m wondering if when you use the acupuncture needles you feel people’s energy and use this and your intuition as a diagnostic tool, which you may when doing tuina. ………………….My second comment is that apparently [this from my same teacher] chiropractic comes from tuina. It normally only ‘moves’ bones but does not soften first, which is a key to the body being able to respond better to the bone placements / changes. Apparently the man who began chiropractic in the USA. Her understanding is that Mr Palmer actually went to China [or else learned from Chinese people in the western world] and left out those major portions, narrowing his practice to just moving the bones [this is my nomenclature, i don’t know how to refer to it. Some people call it ‘cracking’ but that sounds a bit harsh – which chiropractic can be]. ————– I want to add something else concerning the yin & yang portions of the body. The concept of pale & tan may work for lighter-skinned people, but I have another way of understanding this. My perspective changed when I saw a Chinese diagram of the body. If you visualize a person standing with their arms raised above their head with palms to the front, everything in the front is yin, and what’s in the back is yang. Hi Dorrie. I think you’re probably right that tuina is older than acupuncture, but I would need more research. However, I do know that qigong is older than acupuncture. Yes, you can feel the patient’s energy through acupuncture needles, but it’s not a major diagnostic tool. The 4 Pillars of Diagnosis are: Asking, Listening, Looking, and Touching. Examples are Tongue Diagnosis (Looking), Pulse Diagnosis (Touching), and Face Reading (Looking). I didn’t know that Dr. Palmer went to China, but I think your understanding of chiropractic is a bit dated. Modern methods don’t do a lot of bone cracking. It’s a holistic method that has a lot of similarities to Chinese medicine. Regarding your idea of the palms up posture for yin and yang — it’s not correct. If you stand with your hands up and your palms forward, the front is not all yin. For example, the Stomach Meridian runs from your eye, down your chest, down the front of your leg, to the toe. That’s a yang meridian. My example of the pale and tan is better. The areas of the body that get less sun are more yin. The areas that get more sun are more yang. It’s not as simple as front and back. That was such a helpful post! I learned a lot about meridians. I knew some of the information, but it was so nice to have a comprehensive view!